If you have been sitting on the fence, waiting for the best time to buy a home in Tallahassee, you need to know that the bus is here and will be leaving the station shortly. While I confess this is one of those "now is the time to buy" articles that real estate agents spew all the time, I would encourage you to review this report. It provides solid evidence that our market is undervalued at many price ranges and overdue to follow the rest of the State of Florida which is enjoying a housing market recovery. To make it perfectly clear, if you are looking to move in the near future and you plan on financing your home purchase, you should not wait any longer. 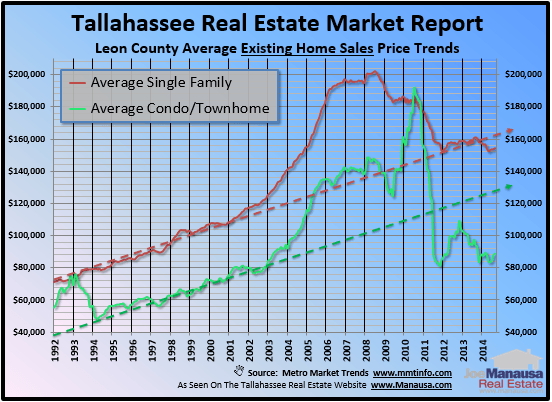 If you take a look at the real estate graph below, you will see 23 years of average home prices in Tallahassee. The red line measures the one-year average of single family detached home prices, while the green line records the one-year average price of condominiums and townhouses. The corresponding dotted lines are my estimate of where prices would be if we simply followed the trend from the 1990s (meaning no housing market boom and bust, just normal slow and steady appreciation). Currently, single family detached homes are still selling below where we would expect them, and condominiums and townhouses and selling for less than 70 cents on the dollar of what we expect from a non-cyclical market. It means that if you are concerned about real estate appreciation, you are likely to experience above-average appreciation if you purchase a home today than you would normally expect over the past 23 years. The cost of construction continues to rise, and so long as Florida grows, it is highly likely that Tallahassee will grow as well. Future growth will help consume the glut of homes for sale in Tallahassee, thus requiring builders to eventually start to build again. And when they do, they will be facing far higher costs than what was seen during the great housing expansion stage ten years ago. When new homes cost more, it drives the values of existing home sales higher. When demand outpaces supply in the future, we will see home prices seek far higher ground than what is occurring now due to the current market (where supply continues to outpace demand). This is why we are seeing long-term real estate investors buying homes now, as they know a five year real estate investment is likely to deliver great returns. The fact that existing homes cost less than what you would spend to replace them is reason enough to buy a home today, but that pales in comparison to the primary reason you need to buy a home today. 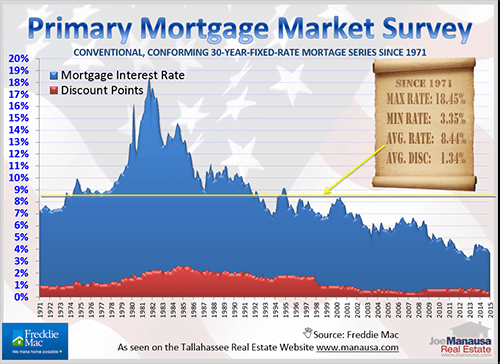 Mortgage interest rates are currently at 1/2 of their fifty-year average. This cheap money is expected to go away after the election, and it will have a significant impact on home affordability in the future. If you are borrowing money for your next home, you win twice. You get to buy a home at a lower than "expected" price, and you get to pay for it with money borrowed at "way below normal" interest rates. This means your monthly payment will be far less than if you wait a few years, and your long-term equity gain is going to be much higher. While the true market bottom was reached in 2012 (both in home values and mortgage interest rates), now is likely the last chance to be able to take advantage of both prices and interest rates at the same time. The "Best Buy" bus will be leaving the station soon, make sure you have a seat!